Classic “Cat Eye” styling for your custom build! • Chrome Plated housing with a durable red plastic lens. • The 2-wire incandescent 1157 bulb works as both a “running” tail light as well as a brake light. • The bottom portion of the housing features a clear lens to illuminate your license plate. • The universal mounting studs are on 2″ centers and come with nuts and washers. • Use with 12 Volt systems ONLY. Finish: Chrome Dimensions: Tail Light Height – 2-1/2″ Width – 7″ Depth (Housing) – 2-1/8″ Depth (Total) – 3″ Fitment: Any bike/mount that accepts the above listed dimensions.Classic “Cat Eye” styling for your custom build! Chrome Plated housing with a durable red plastic lens. 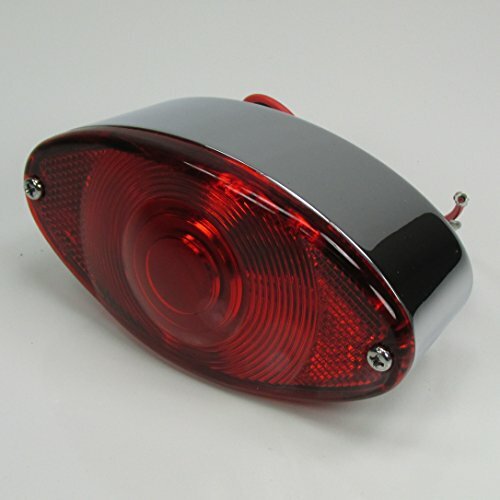 The 2-wire incandescent 1157 bulb works as both a “running” tail light as well as a brake light. • The bottom portion of the housing features a clear lens to illuminate your license plate. The universal mounting studs are on 2″ centers and come with nuts and washers. Use with 12 Volt systems ONLY.